Many thanks, Charles, for your longstanding devotion of talent and energy to this now hard-earned but significant success! The skill and expertise you have brought to bear on this issue are further underscored in this blog item by the very apt and cogent description of the relevant turning point potential for carbon taxation. This is a first step. A new law does not by itself guarantee smooth and effective implementation. Nor does the important precedent of applying resulting revenues to mass transit necessarily ensure competent and efficient application by the public transit authorities of the resulting additional funding. Advocates will need to “hang in there” with this. Stockholm successfully instituted congestion pricing over a decade ago despite considerable initial public skepticism, but within barely half a year it was well-enough received to be ratified in a popular referendum. 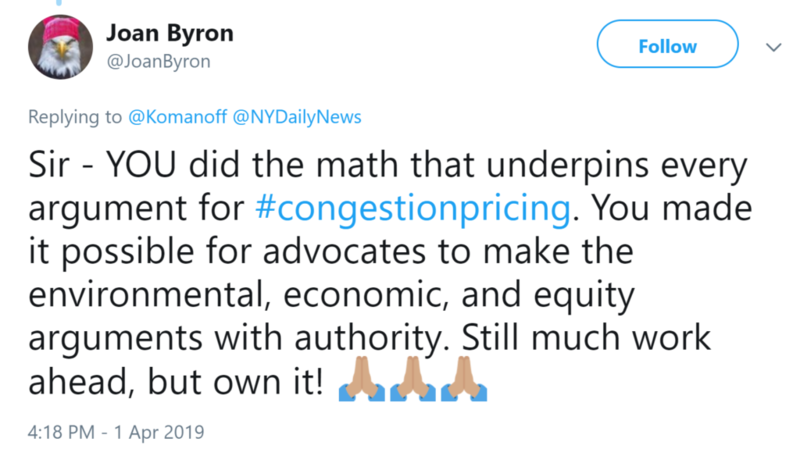 New York’s congestion pricing may face a tougher rollout, but the logic and public interest arguments supporting it are no less compelling. 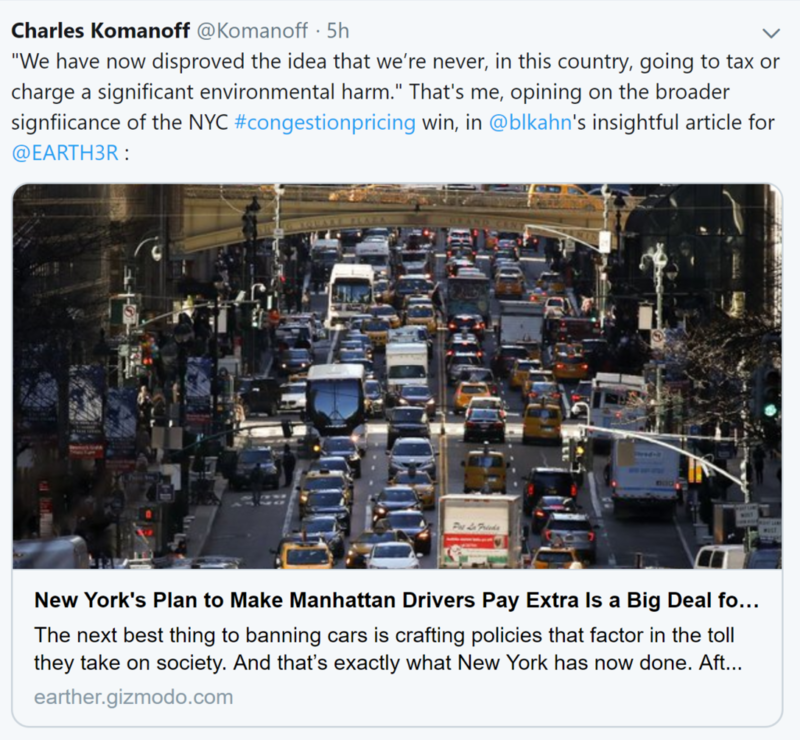 It may also be necessary to push back against mischaracterizations of this being “radical” or “elitist.” In fact, fuel taxes and bridge tolls have been common across the United States for a century or more. Congestion has never been costless before, and new fees on congestion are less burdensome than the productivity lost to gridlock, and more efficient than rationing via alternate side of the street parking rat races, for example. This is nonetheless a very welcome achievement, and, coming after several close electoral defeats for “pricing environmental harm,” very good news indeed. Well, if you’re not going to tout your role, I will. You had no small part in this finally happening. Our real heroes are too often hidden and anonymous. So let’s speak Charlie’s name out loud so people know that real people are what bring about good things. And yes, all of you:: get behind a carbon tax! Write your congressional reps now! Support the bill that Citizens’ Climate Lobby supports (not the bill that would get corporations off the hook). Get involved already!!! And tell your addle-headed “social justice” people that history will judge them as jerks and ideologues unless they stop opposing a carbon tax and get on board with the right people going in the right direction. Full cost pricing. Let all goods reflect the true costs of production.